Can a 9 x 5 hallway bathroom be luxurious? This was the question I asked myself about a year ago, when I was entrusted with full creative responsibility for our bathroom remodeling project. If you spend time scrolling Pinterest you might get discouraged by the many pictures of sprawling marble bathrooms with their raised bathtubs, hanging chandeliers and French windows. No one has room for that in New York City, but I was nevertheless determined to transform our crumbling pre-war apartment bathroom into a thing of beauty. Thanks to some obsessive compulsive tendencies and way too much time on Google images, I was able to able to strategize as to how to achieve my desired aesthetic while making the most of the available space. We knew right away that we wanted to avoid the cold “hotel bathroom” look. You’ve seen it: silver and chrome, with gray-veined marble and harsh light, all and all not particularly inviting. On the other end of the spectrum are beige bathrooms, something I’ve seen a lot in the suburbs but which I always felt produced a hard, headache-inducing yellow light. For color palette inspiration, I turned to my coffee table book on Damascus. The marble, alabaster and creamy hues in the city’s architecture create a soft warmth, accentuated by the local milky-golden light. I used these tones as a guide when selecting our tiles and paint color. For an older building, I wanted to go for a look that was urban yet classic. Not only do Parisians pull this off well, but they also live in apartments up to hundreds of years old and know how to work with tight spaces. I scoured the internet for pictures of traditional French bathrooms and made note of a few recurring features, including exposed plumbing and a classic black-and-white floor tile. As I said, the room is 9 x 5, which creates some obvious limitations. 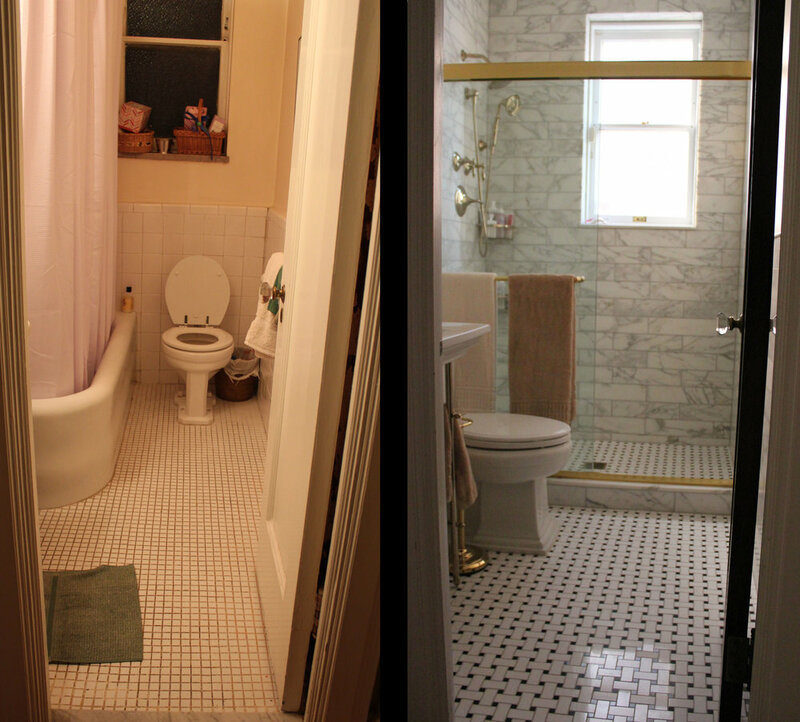 We were able to open up the space by tearing out the tub and placing the new shower parallel (as opposed to perpendicular) to the back wall, which in turn creates an unbroken line all the way to the back. I was initially turned off by the idea of a window in the shower, but the internet confirmed this is actually a common configuration (provided you have frosted glass windows). In the interest of creating the illusion of a larger space, I wanted to use the same tiles on the entire floor, in order to create one line extending from the entrance to the back wall. This meant that the floor tiles had to be shower safe, and therefore small. Drawing from my French bathroom inspiration, I opted for a classic black-and-white marble basketweave from Artistic Tile. It was a bigger challenge to find the right tiles for the wall, because so much of what’s available is gray marble, exactly what we wanted to avoid. We finally discovered Calcatta Gold marble, also from Artistic Tile, which features gray and gold veining on a creamy background. 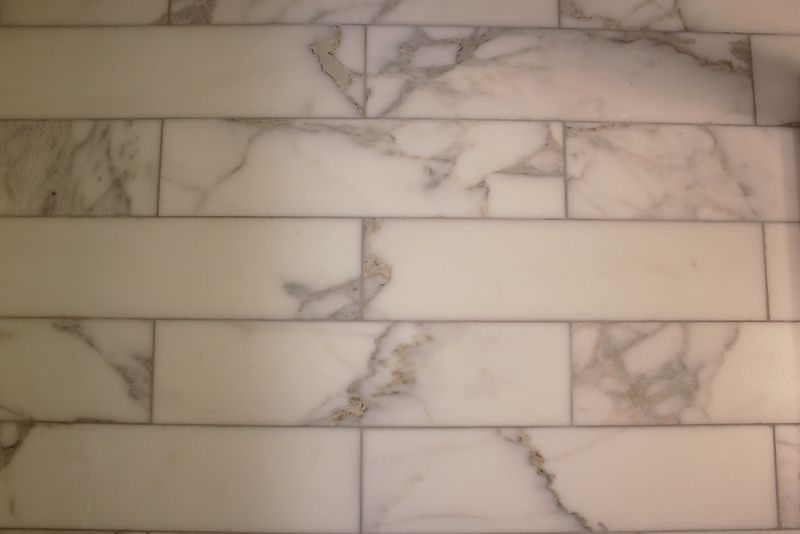 Honed marble, as opposed to polished, softened the contrast between the colors, and alabaster grout helped bring out the warmth. At 4in x 16in, the tiles are longer than your standard subway tile, but I thought this would help create the illusion of greater length and width. The tiles only extend all the way to the ceiling in the shower; otherwise we would overemphasize the high ceilings, instead of the area space. 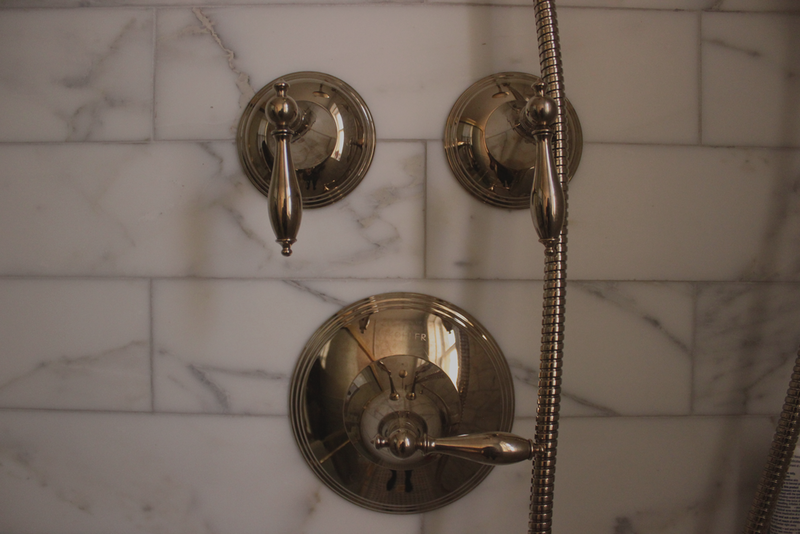 The goal was to use the fixture finish to bring out the gold veining in the tile. Despite the overwhelming popularity of silver and chrome finishes, we were willing to look a little harder for gold finishes. Both Kohler and Newport Brass produce a French Gold finish, which isn’t too yellow. We weren’t able to match the shower frame and lights exactly, but fortunately the contrast isn’t very strong. The sink is a console with exposed plumbing. Not only does this play up our urban aesthetic, but it also allows you to see right through the legs, versus a bulky cabinet. This helps maximize space, while the rack on the bottom provides a little storage. The glass shower also helps show off as much space as possible. We chose a creamy paint as opposed to a standard white - again, to create warmth and bring out the tones of the tile.